Children can become more involved by practicing ” like” actions in the sink. If you are mixing something in a bowl with a spoon, you could give similar ingredients or just water in a bowl (set it in a clean sink) for your child to stir. If he or she has difficulty keeping the water in the bowl you can use colored water or jello to show them the splashes that are coming out into the sink. Keeping the area clean and the ingredients in the bowl can be not only the goal but made into a “game.” The first time a child uses a tool should be in a fun setting- Try using the mixer with water in the sink. Children inevitably lift the mixer out of the liquid while the power is on, splashing everything around. It is much easier to clean water than beaten egg splashed all over the cabinet. Making pudding (perhaps bought for .25 /3 as in Real Deals) is a great starter recipe. A whisk can be used to mix the pudding into the milk. A single measuring cup , clearly marked 1 cup can be used to measure the milk and even very young children realize putting 1 and 1 together give you 2 thus meeting the measurement for the milk. My mom use to tell us “Watch one, do one, teach one”… well I apply this to my children. I show them -they watch, I watch- they do, and then they teach – generally a sibling (while I supervise!) By this point the child is able to do what they need to independently because along the way they have asked questions! Children love to teach or be in charge. Cooking with kids recommends taking the pudding mix and putting it into a ready made graham crust for your first recipe. Cheesecake pudding would not require any extras. This fall pumpkin pudding pie and this pistachio pudding pie have a few extra add in ingredients. 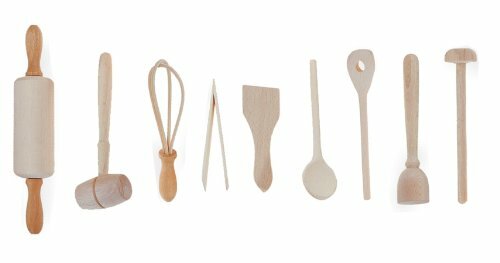 Amazon: Fox Run 9 piece kitchen tool set– for cooking with kids: the pieces are made on a smaller scale to fit smaller hands!